You may not be Wonder Woman, but you can leave them wondering, “Who was that woman?” Boojee Beads has a full line of on-trend, fashionable work ID holders designed for the professional woman. These ID badge holders work with any look to help you pull together that perfect image. Pinstripe business suits hit the runways of Altuzarra, D&G and Max Mara. Keep in mind that a pinstripe suit will always make an impression. In fact, a study shows that people take men in a tailored suit more seriously, so when you want that kind of impact, don your best, tailored pinstripe and knock’em dead. Our ID holders and other identification jewelry are always on trend because we follow the runway and refresh our lines with several new beautiful designs every 120 days. For that and many other reasons Boojee Beads is a unique company. As a women-owned business, we know what women need in their professional lives and when our products hit the market 16 years ago, we lead the identification jewelry industry then … and today. Our fashionable accessories exceed working women’s expectations. Searching for a present for a working woman you love? Browse our entire collection of gorgeous chain lanyards, or pick from our gift sets! You go to great pains to project that perfect image in the boardroom. Don’t stop at your ID badge. Our lanyards have stepped into the world of fashion. Complement your business suit with our handmade Stella Beaded Lanyard. Made with various sized beads in basic black, this lanyard has the look of a stylish necklace. The spinning lobster hook keeps your ID safely at hand. This piece is both simple and sophisticated. Geometry reminds us of larger spaces and modern architectural projects, such as the BIG apartment building in New York in a tetrahedron shape, the Louis Vuitton Island Maison in Singapore and more. Our Anna Fashion Lanyard combines chain with open-work metal geometric shapes for a modern flavor. >> If you’re considering doing a bulk order for your entire office, conference or event, contact us online call 888-726-6533 for discount pricing. Try a stunning look with our Kiawah Chain Lanyard. This eye-catching lanyard has a rose gold tone chain and a beautiful black and crystal pendant. In classic black, you cannot go wrong in a high-profile business meeting. When you are spending the day around the office, you can bring a touch of style to the all of that business atmosphere. Our ribbon lanyards are as durable as they are fun to wear. 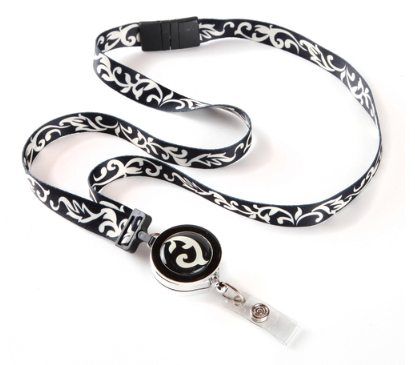 The classic black and white oriental design on our popular Ebony and Ivory Ribbon Lanyard combine grace with a bold look. This 3-in-1 lanyard give you options for every day. Nothing says classic like a tapestry design. 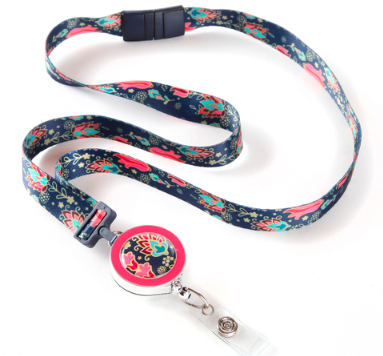 Show everyone in the office what a classic you are with this Tapestry Ribbon Lanyard. Our 3-in-1 design allows you to show your softer side in three ways. Wear it as a lanyard with the reel, as just a lanyard without the detachable reel, or wear as a badge reel only. Either way, you can feel beautiful while still presenting your professional side. 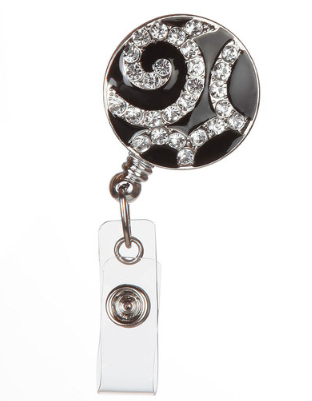 On days where less is more, our Audrey Badge Reel gives you the look of elegant power. The black background and rhinestone swirls prove an exceptional touch to any power suit. As part of the trend towards peace and tranquility, our Elephant Badge Reel symbolizes both peace and tranquility as well as wisdom and love. This retractable badge reel is all about the intricate filigree design, dotted with sparkling rhinestones for a gorgeous look. This adorable little guy carries a sophisticated, international look that is suitable for any situation. All of our badge reels have sturdy 32” cords that resist tangles and fraying and the clips stay put until removed. Our stylish reels will get you through your day, worry-free. The retractable action is so practical because instead of having to detach and re-clip your ID badge or keycard every time you need to use it, you can simply give a little tug on your ID, which stretches out the cord and when you’re done with your ID, the badge simply recoils the cord. Our work ID holders not only fill a practical use, they help you feel good at the same time. With a full array of products to allow you to express yourself in a corporate world, Boojee Beads will be your only destination for badge accessories. No matter which style you prefer, let Boojee Beads fill your order. We have competitively priced products so you can choose a style for every day. Visit our website and browse our selections, or reach out with any questions you have. Our professional staff will be happy to help you. Contact us online or speak with someone directly at 888-726-6533. Our award-winning representatives can help you find an ID badge holder for your entire office, for a conference ( ask about the bulk order discount) or as a gift for a friend or colleague.